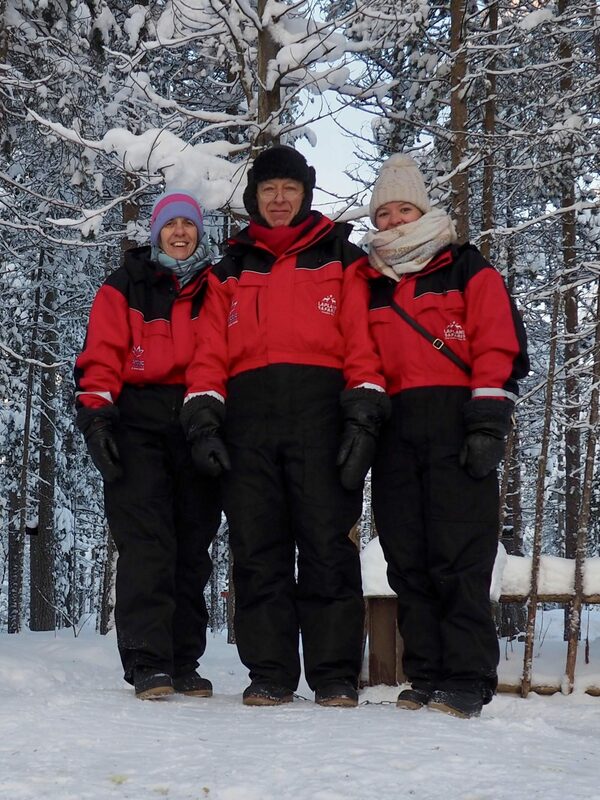 I’ve just got back from an amazing trip to snowy Lapland with my parents. I had some leave in January and with no plans in place, decided it was time to tick a new country off the list! 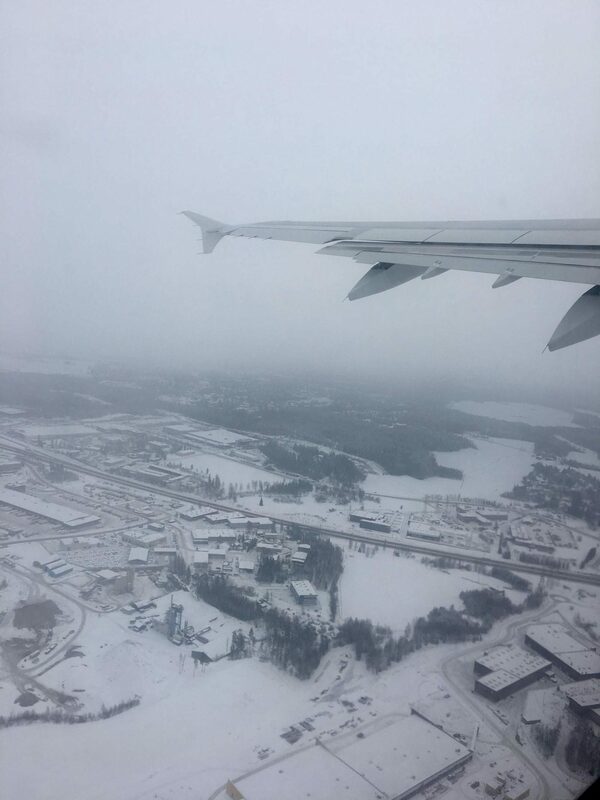 I flew from Dubai with Finnair (on standby), leaving at 6am and landing into Helsinki at just after 10am. 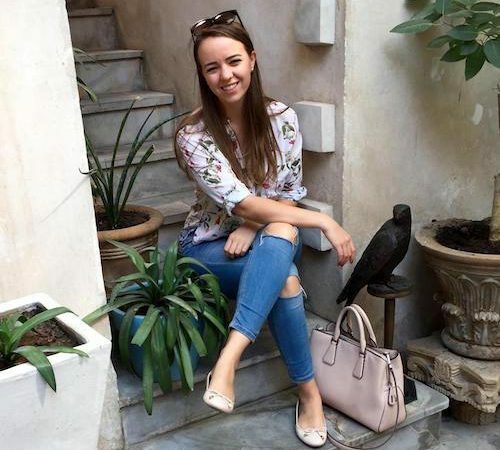 Since I was only travelling with hand luggage, it was an easy connection to the next gate, where my parents, who had flown in from Heathrow the night before, were already waiting. 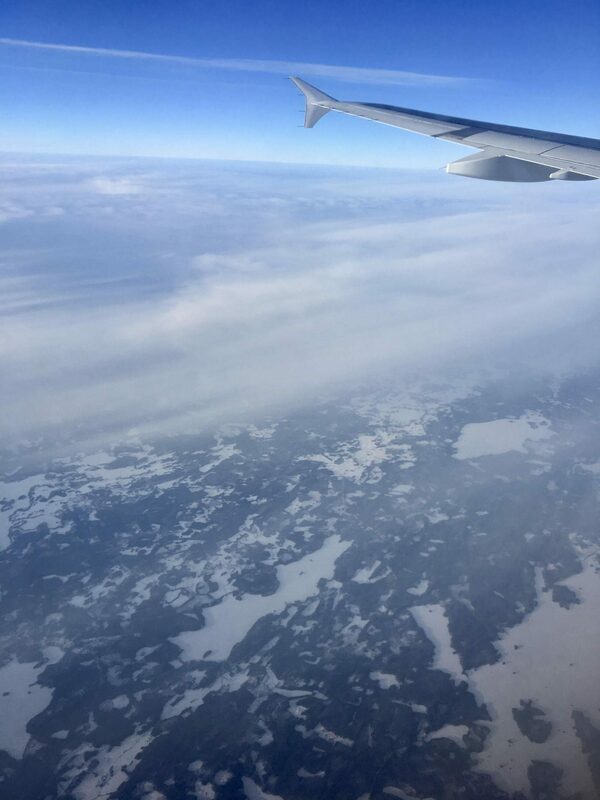 Soon we were on our way to Rovaniemi, which was around an hour by plane. 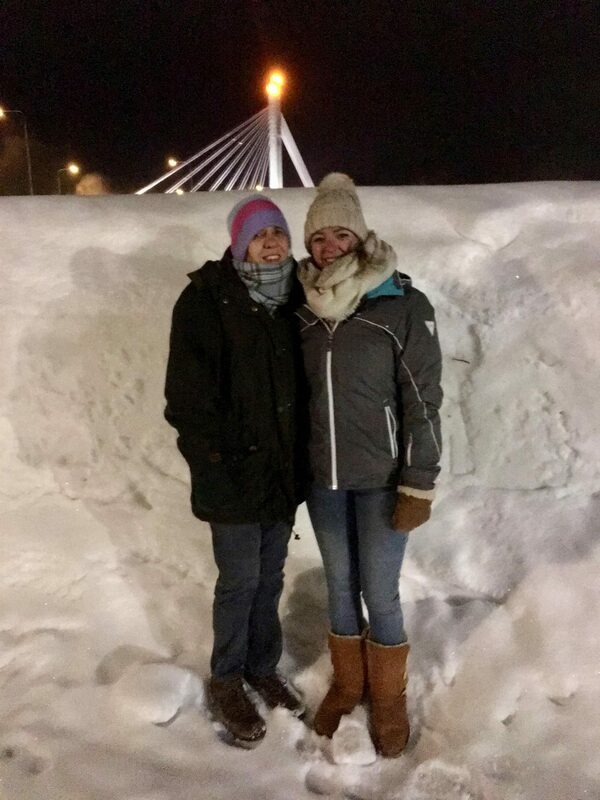 As you can see, it was pretty snowy! 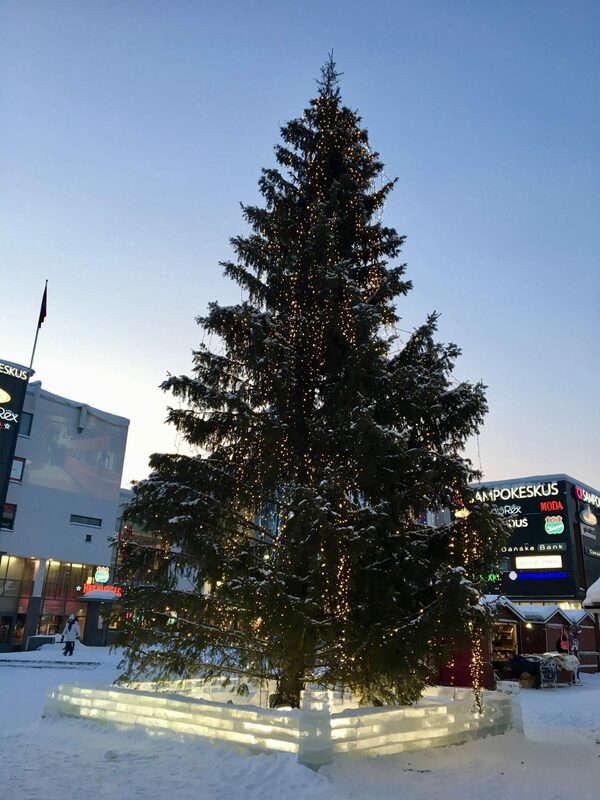 We touched down into Rovaniemi Airport (also known as Santa’s Official Airport!) at lunchtime, and could already see the sun starting to set. 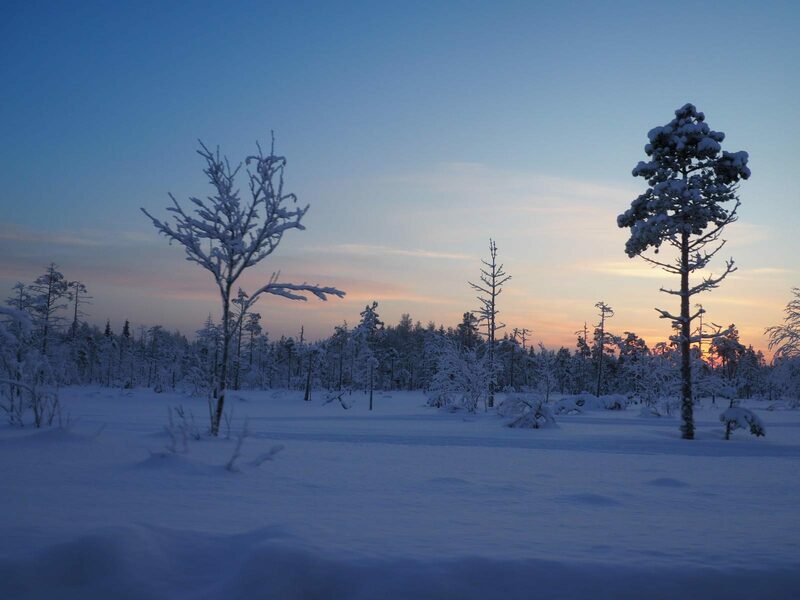 There aren’t many hours of daylight in Lapland during January, with the sun rising just after 10am and setting around 2:30pm. 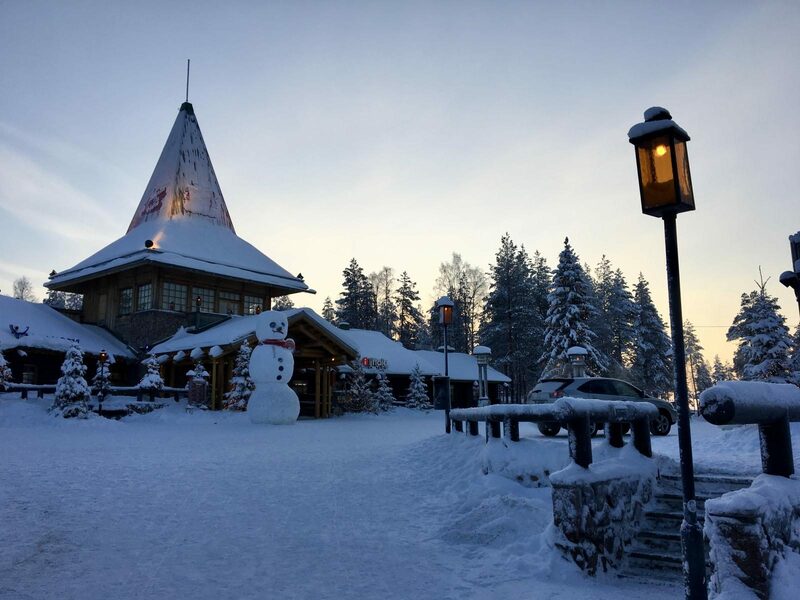 We checked into our hotel, the Arctic Light Hotel, in the centre of town. 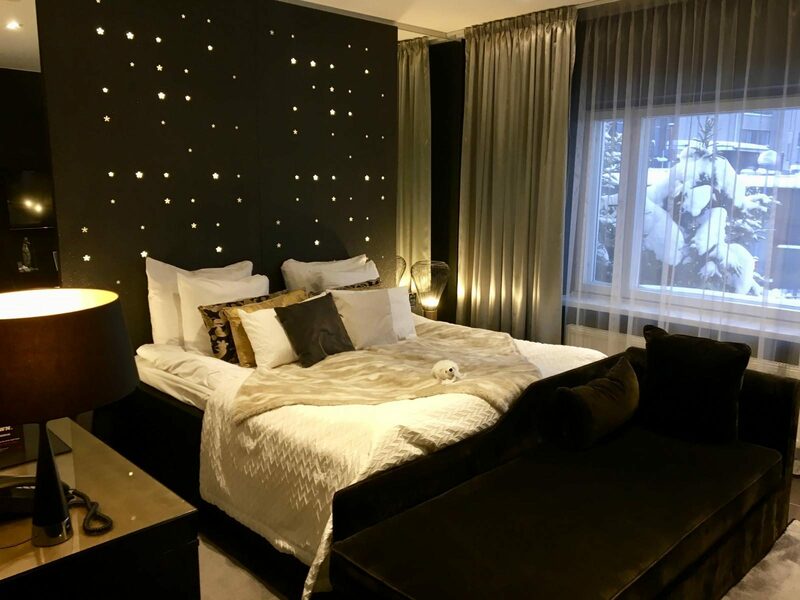 The rooms were beautiful, with lots of local touches and cozy lighting. 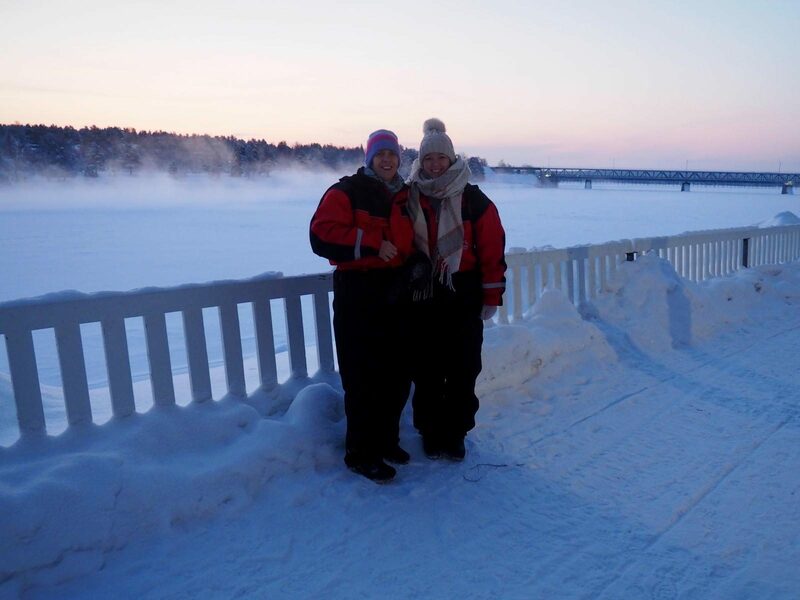 We had a stroll around town, with plenty of stops inside to warm up from the chilly temperatures of -15°C! 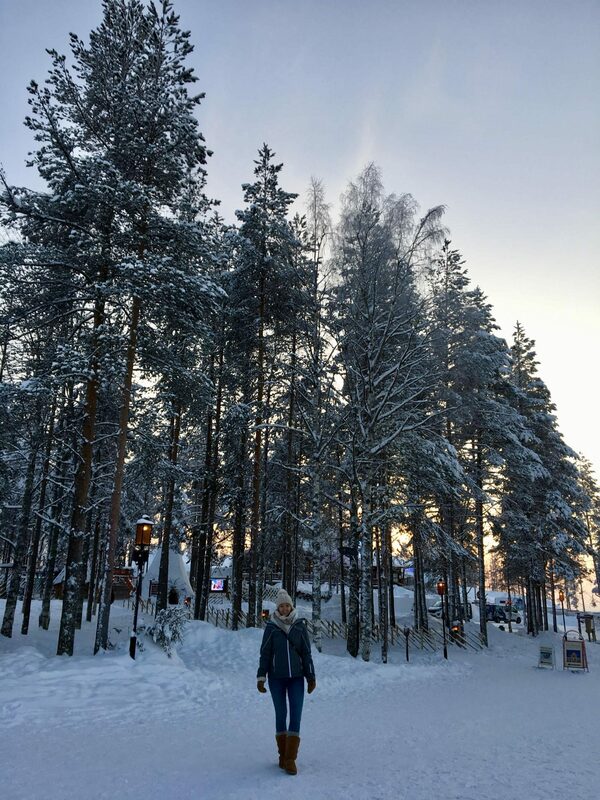 We had another stroll before dinner at our hotel restaurant, which was delicious. 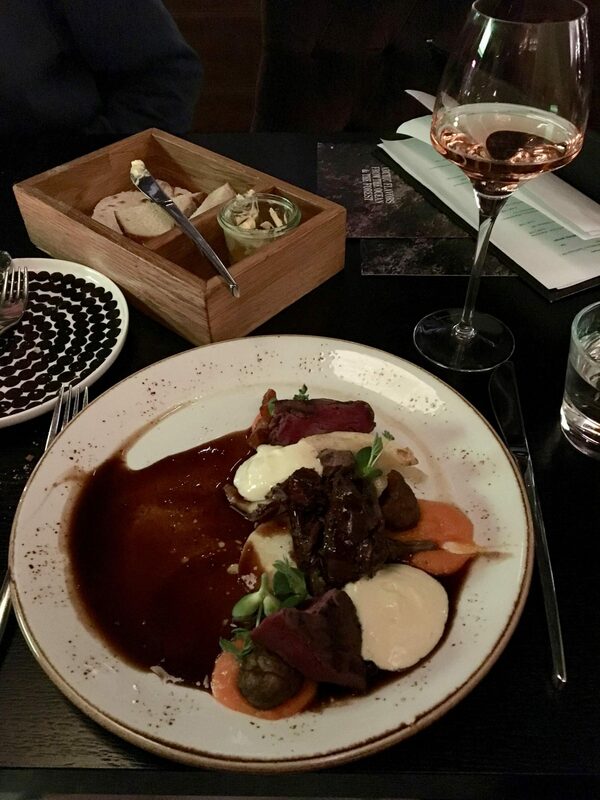 I tried not to think of Rudolf whilst enjoying a delicious piece of tender reindeer! The next morning was time for our first adventure. 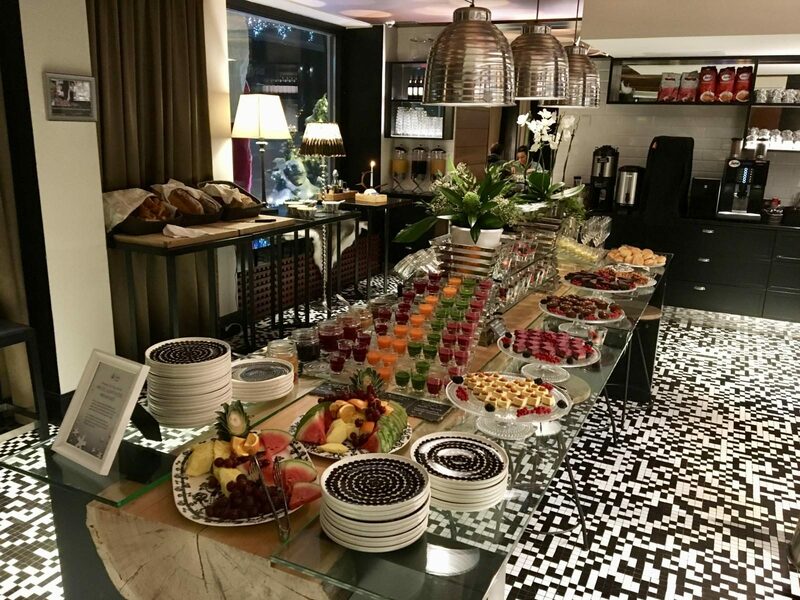 Not before fuelling up at the incredible breakfast buffet of course, which included everything from green juice shots, to mango chia pudding, and delicious home made pastries. 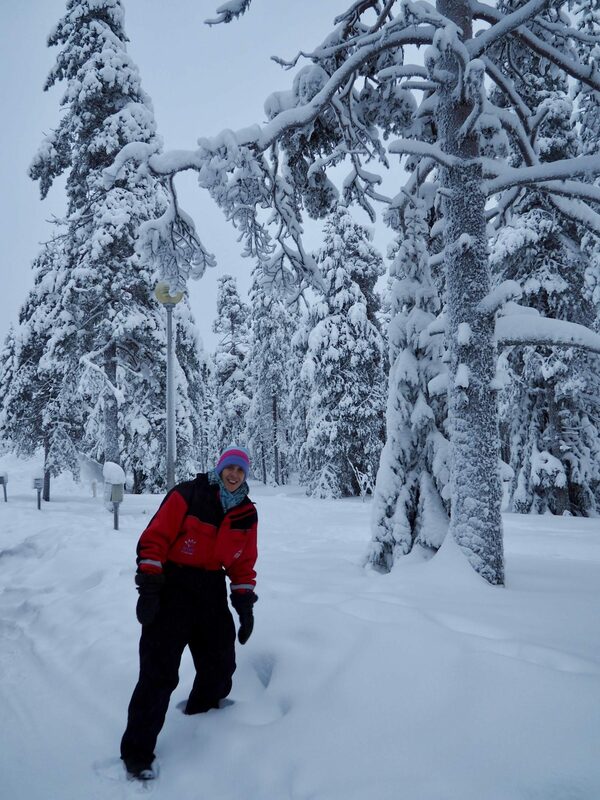 We walked over to the office and were kitted out with snow boots and woollen socks, overalls, and mittens. 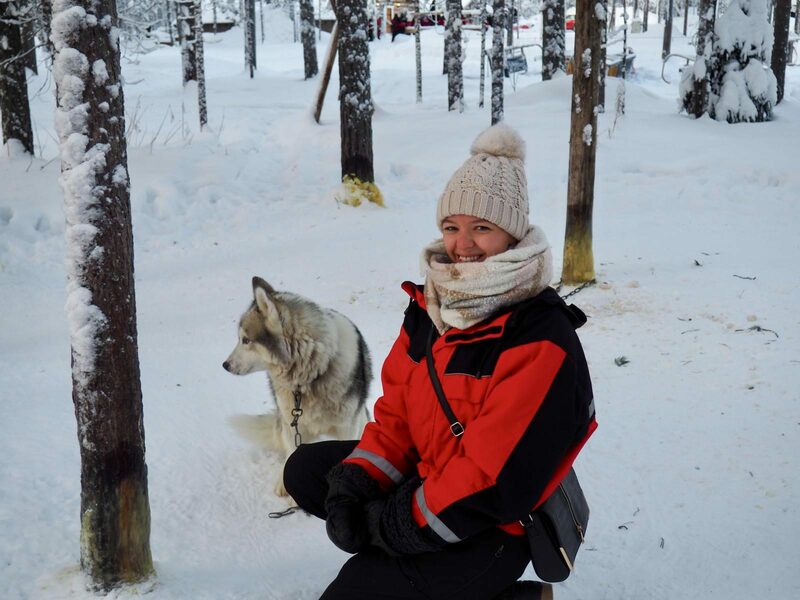 From there it was a quick 10 minute coach ride to the husky farm, where we were given a demonstration and instructions of how to handle the dogs and drive the sledge. 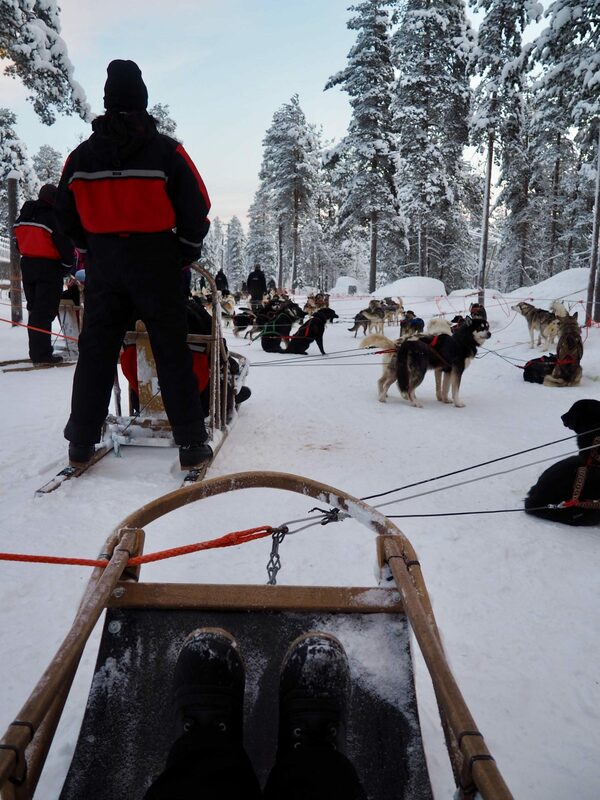 The sledges are driven in pairs – one person is the passenger and the other is the driver. As mum and dad went together, I was paired up with another guy who kindly volunteered to drive first! 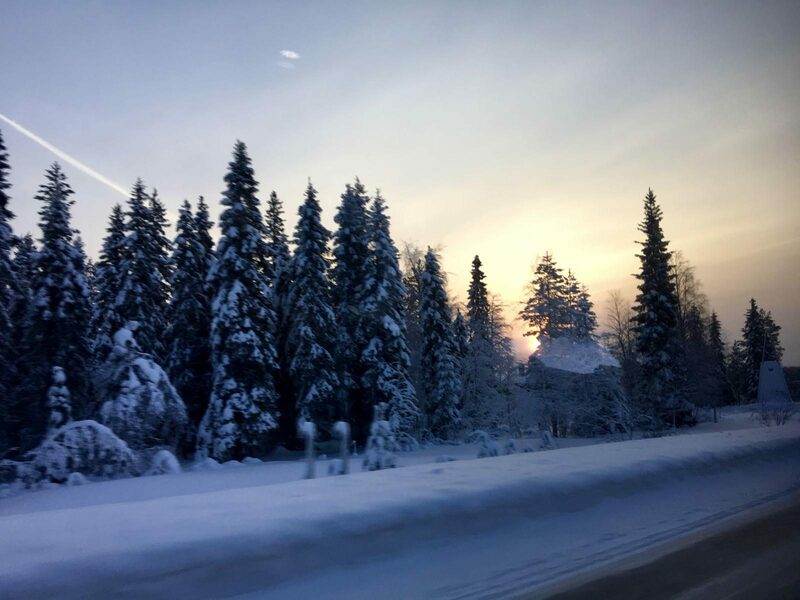 Soon enough it was time to get going, and in convoy we drove through the incredible snowy woods, watching the sun rise. Halfway through the hour long ride, we stopped to switch over. 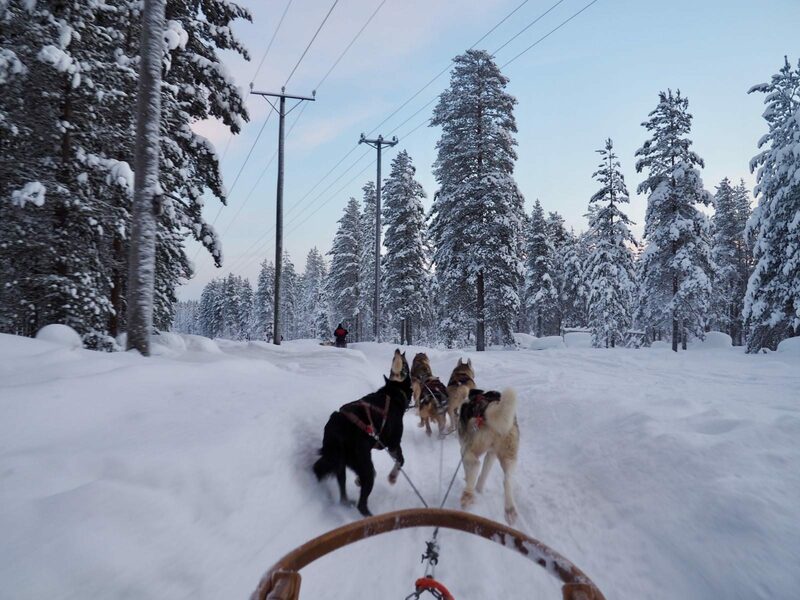 I’m glad I managed to get pictures whilst sitting as the passenger, as obviously you can’t take any while driving as you need to have both hands on the sledge. 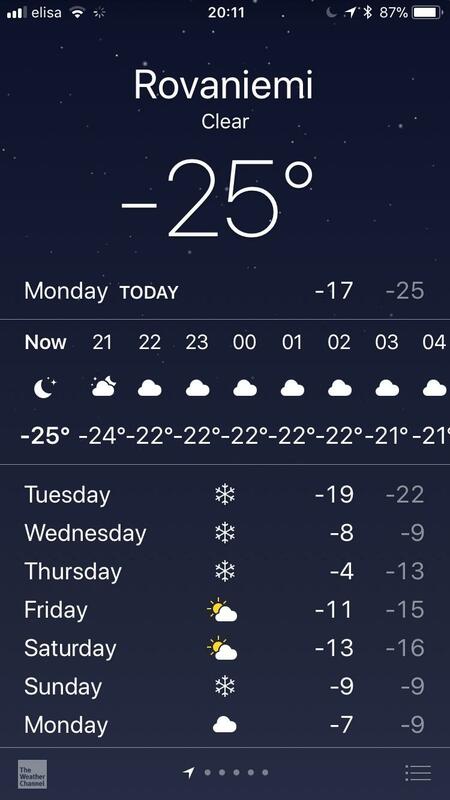 Luckily my camera battery was mostly ok with the cold, although my iPhone went from being fully charged to 1% pretty much every time we stepped outside! 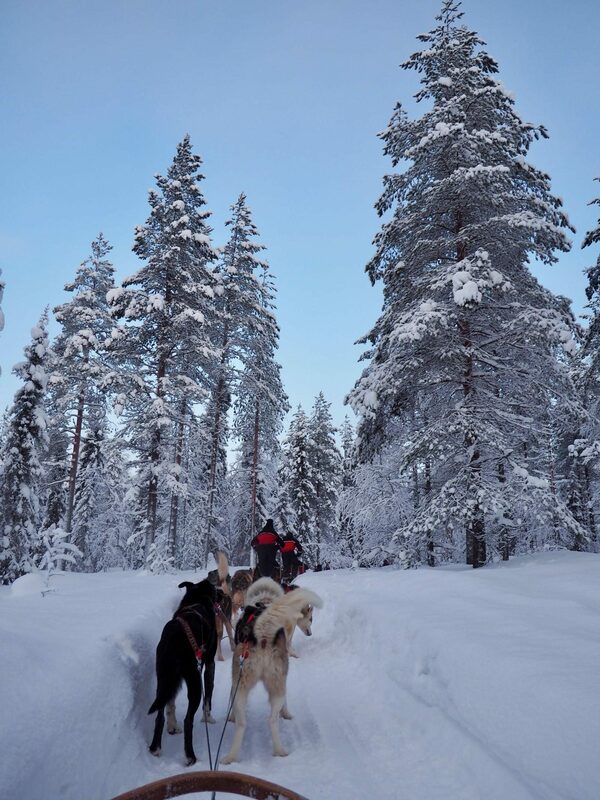 After the ride, we got a chance to warm up around a fire with some hot berry juice, and give the dogs a stroke. 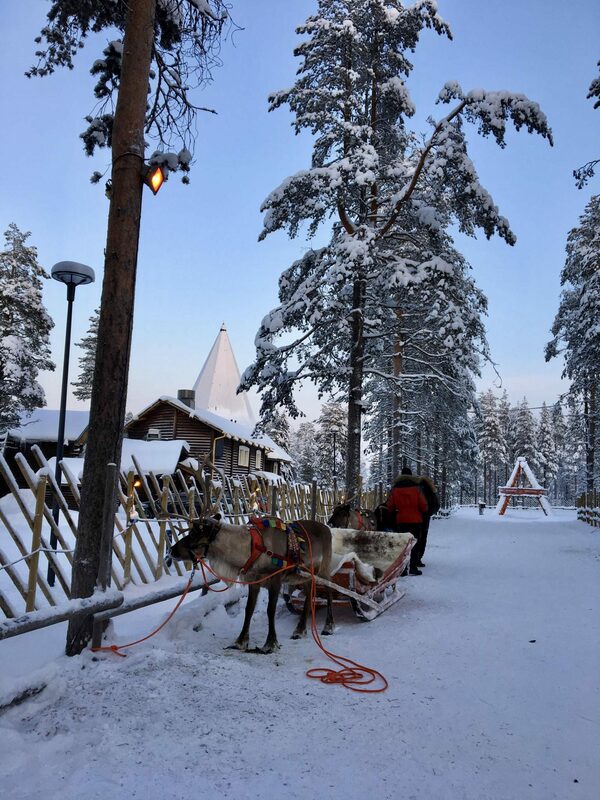 Now, I know it sounds very touristy and perhaps a little childish, but who could pass up the chance to visit the real life Father Christmas at his home in Santa Claus Village in Lapland?! 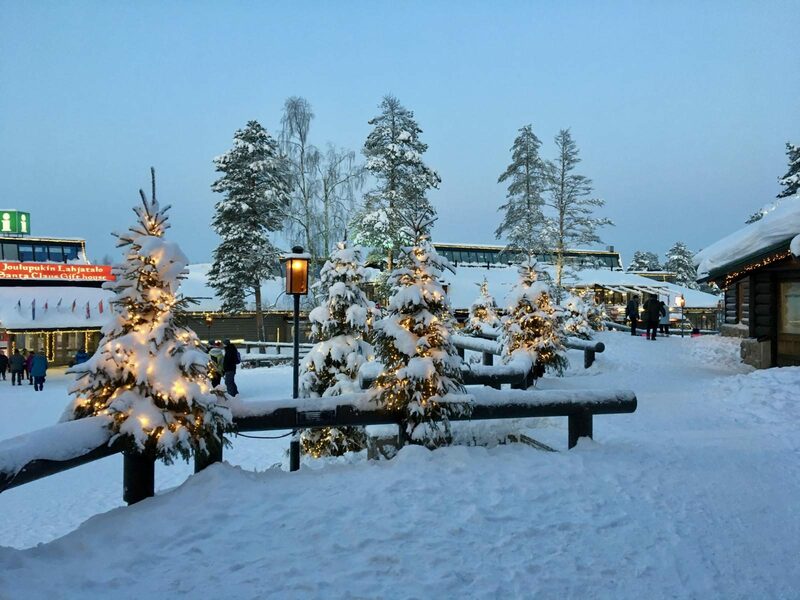 From Rovaniemi it’s an easy 10 minute bus ride to Santa’s Village, and it’s free to enter. 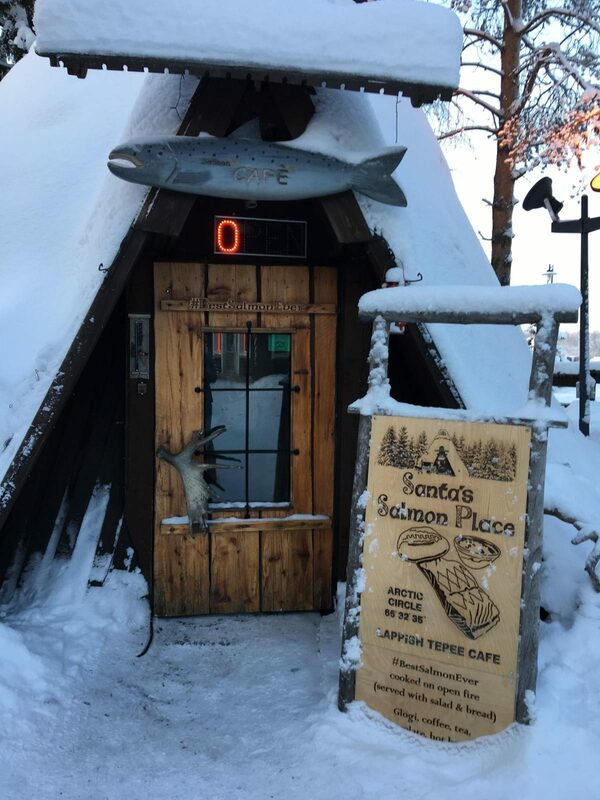 Having been out in the cold husky sledging all morning, our first stop was to find some lunch, and I’d heard good things about “Santa’s Salmon Place”. It’s essentially a teepee with a large fire in the middle, where they grill the most delicious salmon I’ve ever tried directly over the flames. 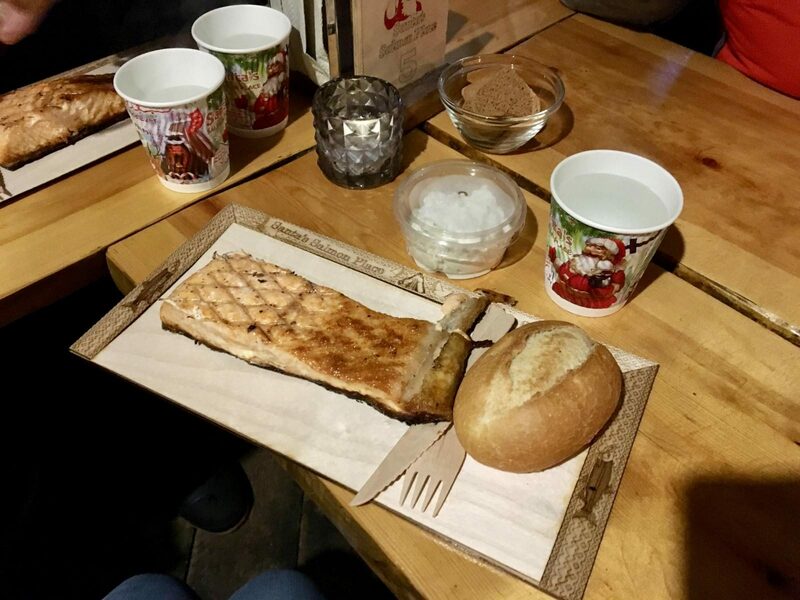 After enjoying our salmon, it was time for a walk around Santa’s Village. 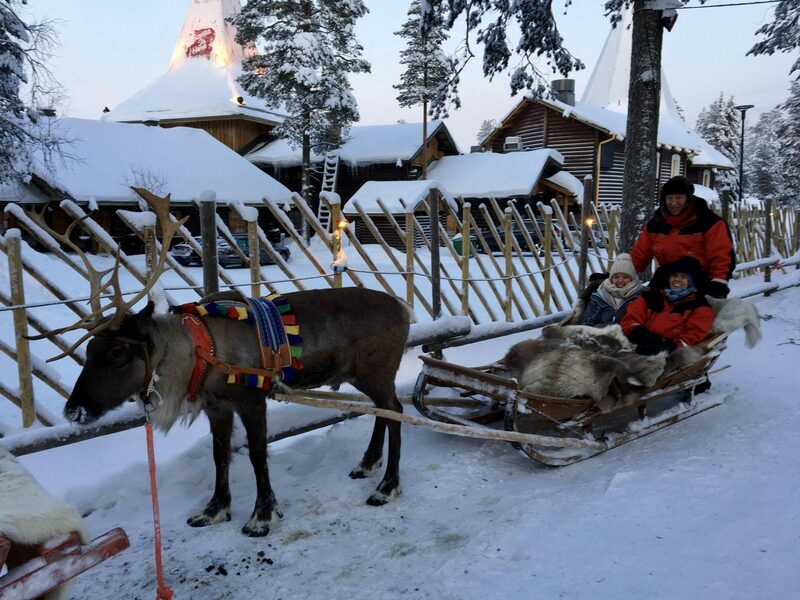 We popped in to see Santa Claus and his workshop, although sadly you can’t take any pictures with him – although you can buy them from the elves! 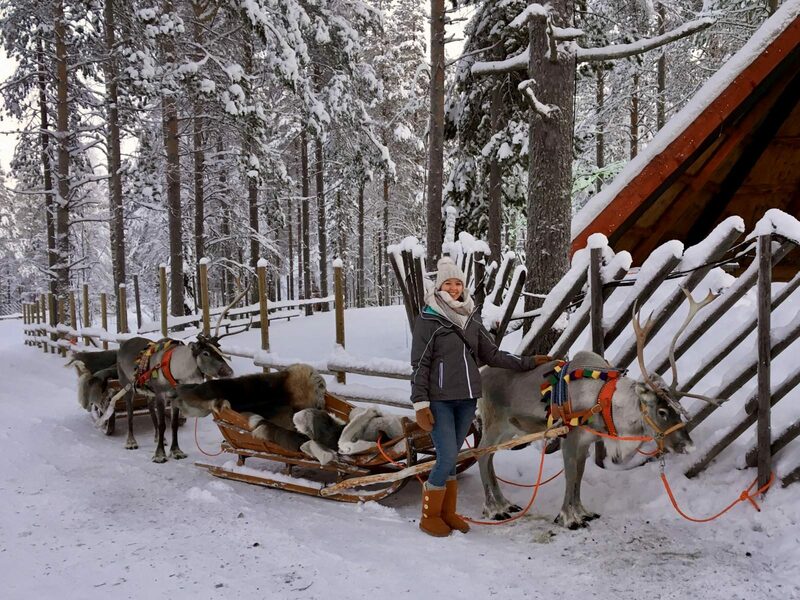 You can also go on a reindeer ride at Santa’s Village, which took us through the snowy woods. 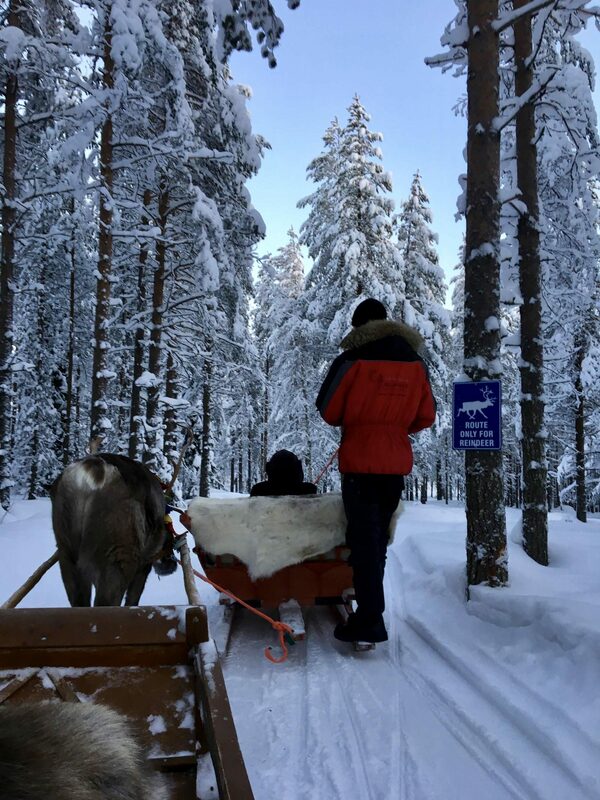 You have a reindeer blanket on the sleigh which kept us nice and warm during the ride! As the sun was starting to set we headed back to the bus stop just outside the entrance, and back to our hotel to warm up. 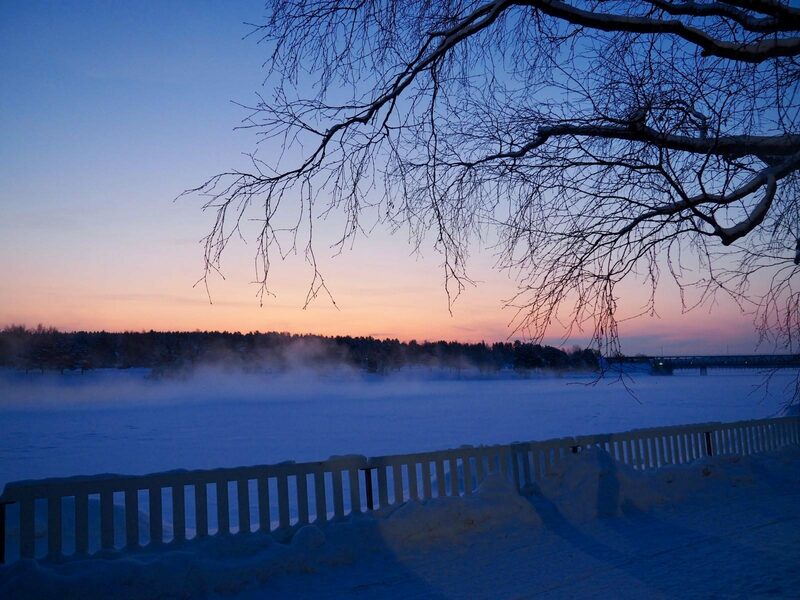 That evening after dinner we went for a walk along by the frozen river in the hope of spotting the Northern Lights, but sadly even after waiting quite a while we didn’t spot them. 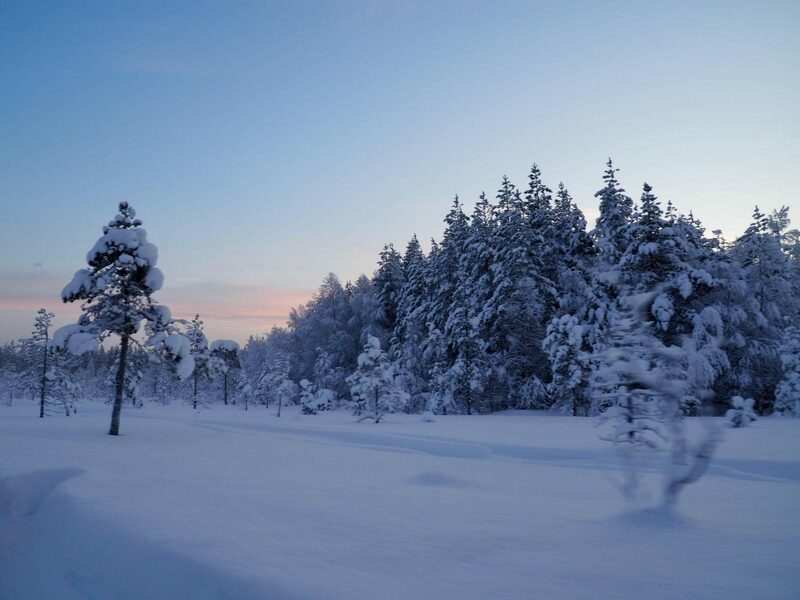 You can do an organised tour which will take you out to the countryside to see them but again there is no guarantee, so we decided to pass this time. 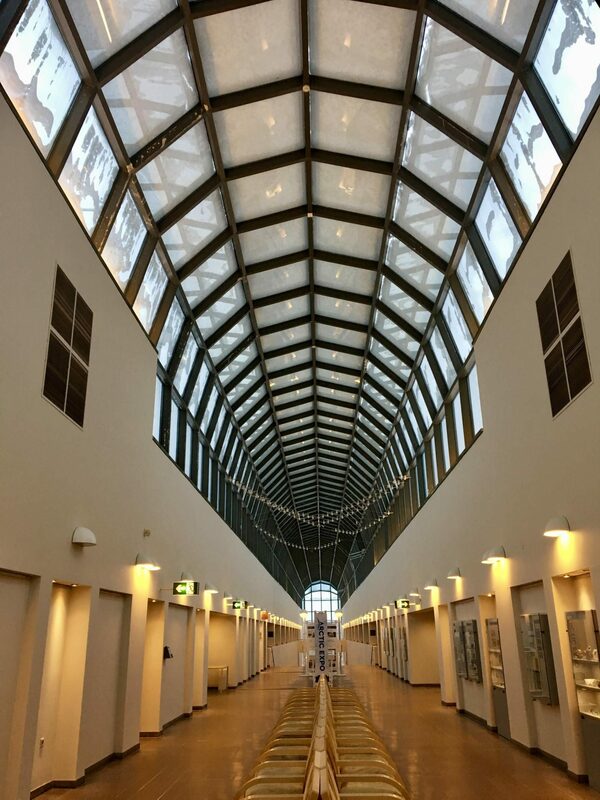 The next day we had a snowshoeing trip booked for the afternoon, so decided to spend the morning learning a bit more about the Lappish culture in the Arktikum museum. 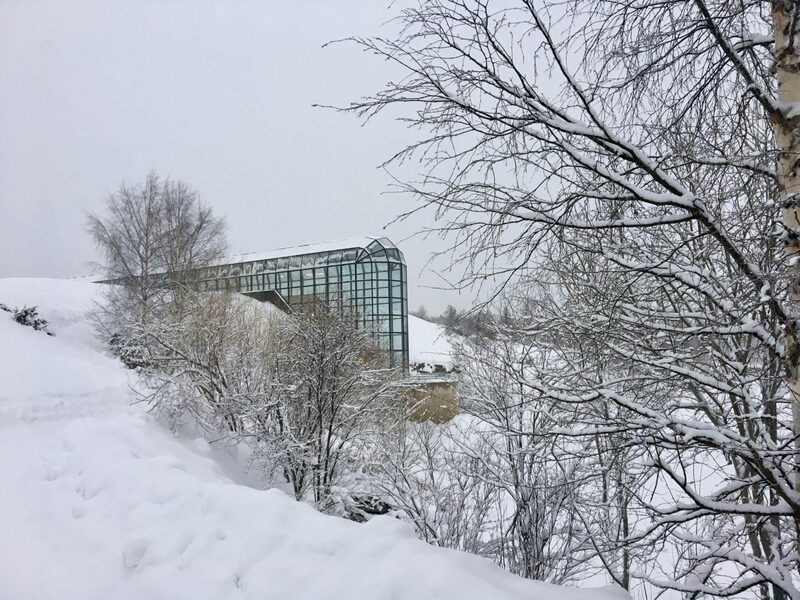 Just a short snowy walk from our hotel, the Arktikum Science Museum explores culture, history and modern life in the Arctic. The museum is really interesting, with a lot of interactive displays. 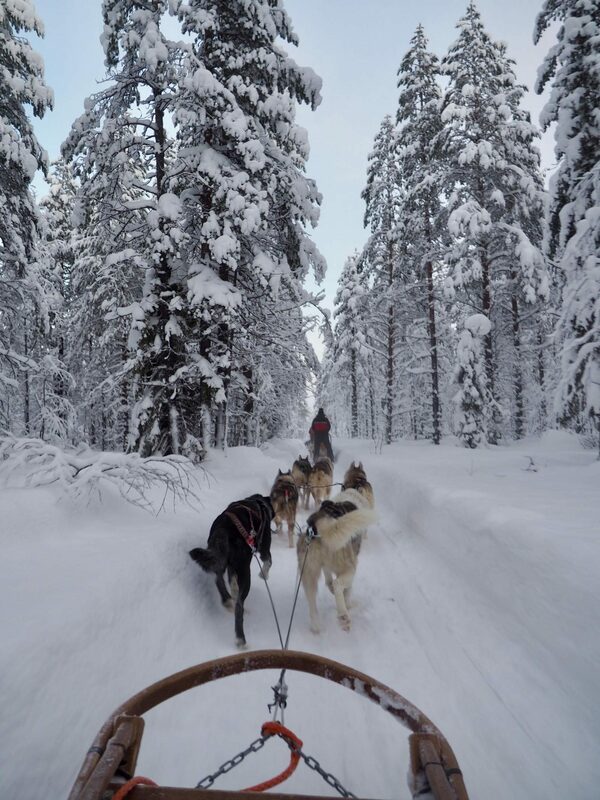 A good way to spend some time indoors when it’s -20°C outside! 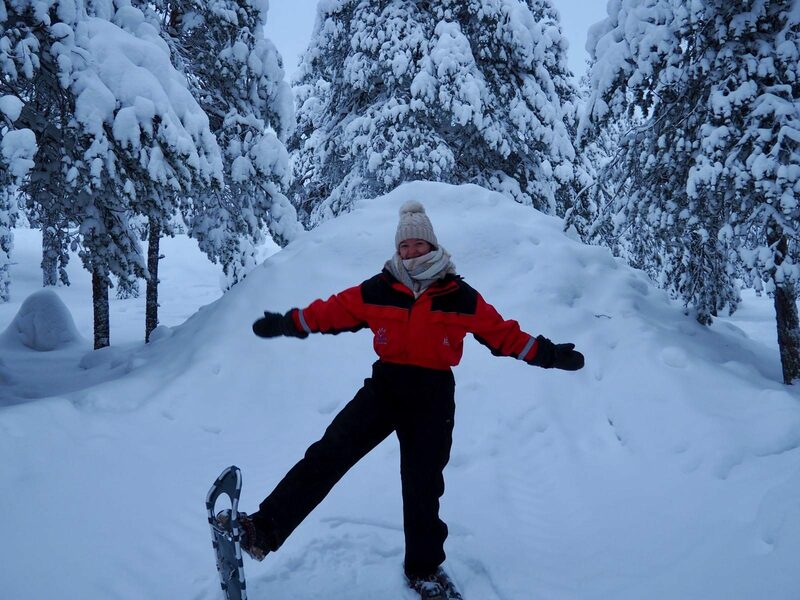 There are lots of activities available in Lapland, and we decided to try something new – snowshoeing! We started out just as the sun was starting to set, and we strapped on our snow shoes. The guide led us through the woods, and around halfway we stopped at a little hut, which had a fire prepared and ready to be lit. 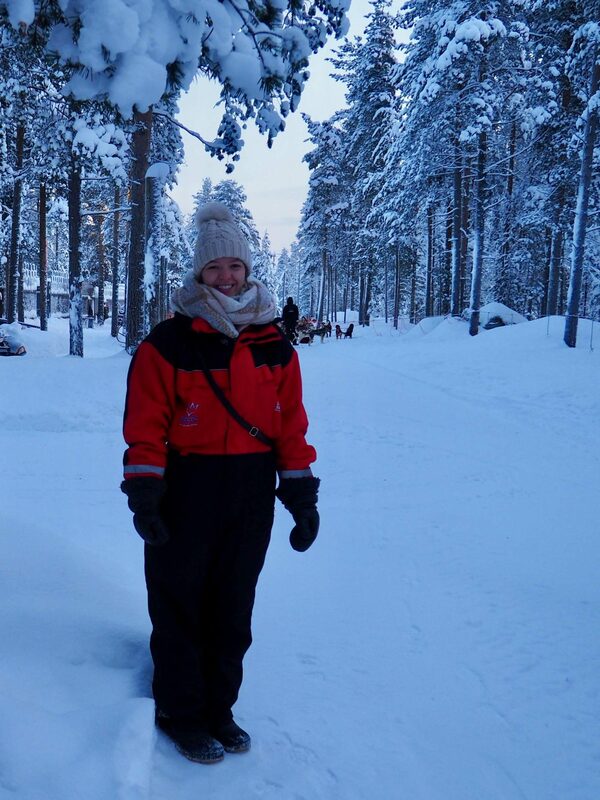 I had so many layers on the I was actually warm whilst walking, and once we stopped at the hut it was starting to get dark outside and we all got a bit chilly. 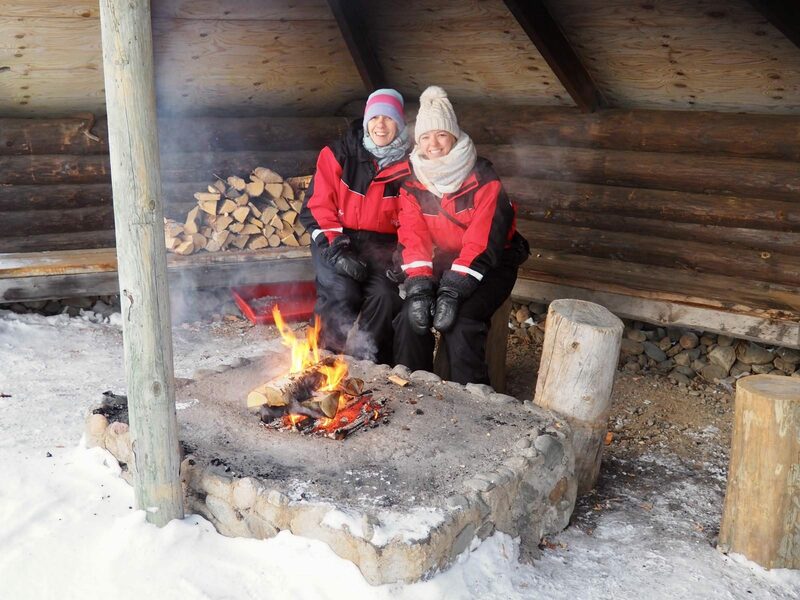 Once the fire was lit we warmed up our hands, and the guides grilled some sausages for us to snack on. 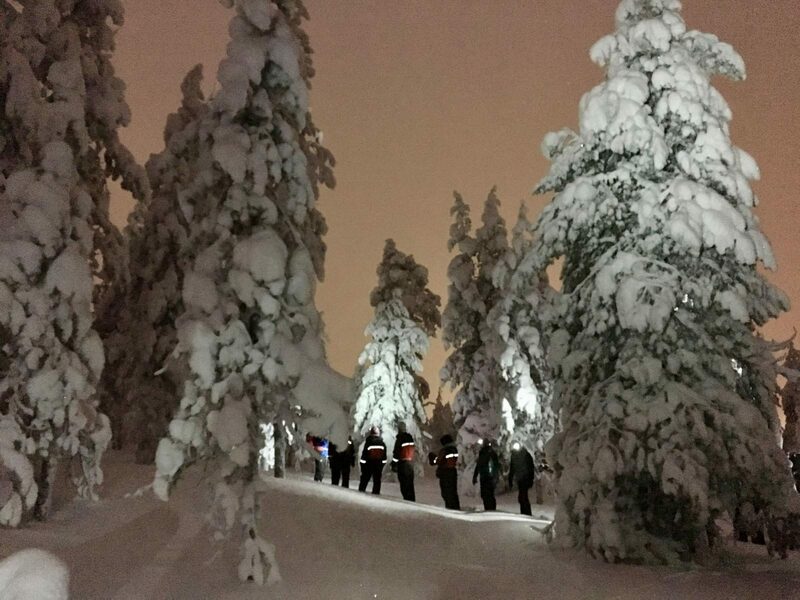 Headlamps were passed around and soon we were back out in the snow, making our way though the woods. 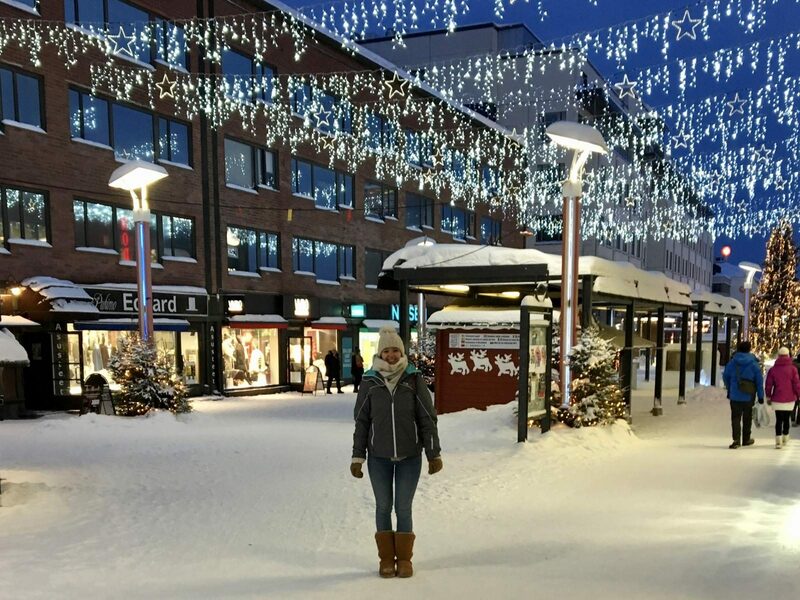 The snow looked so sparkly in just the light of the torches! 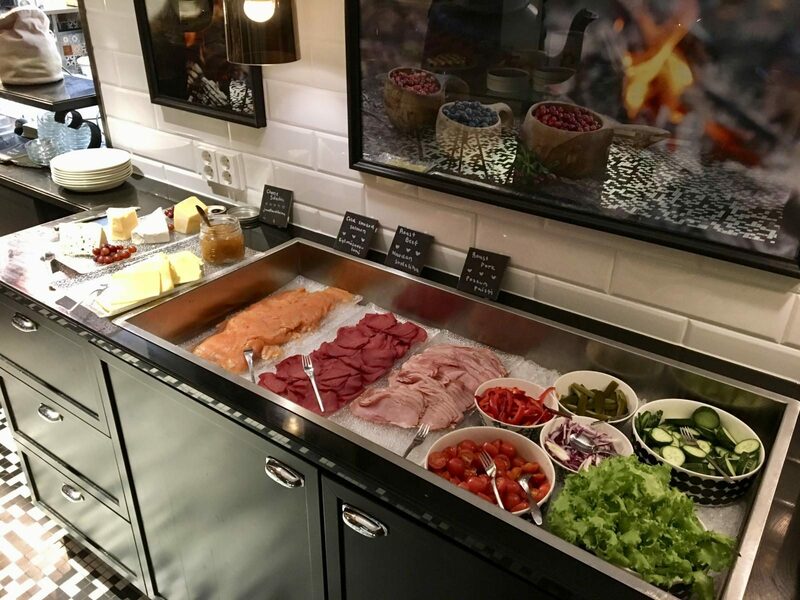 We enjoyed our last delicious dinner in Rovaniemi before an early flight to Helsinki the next morning. 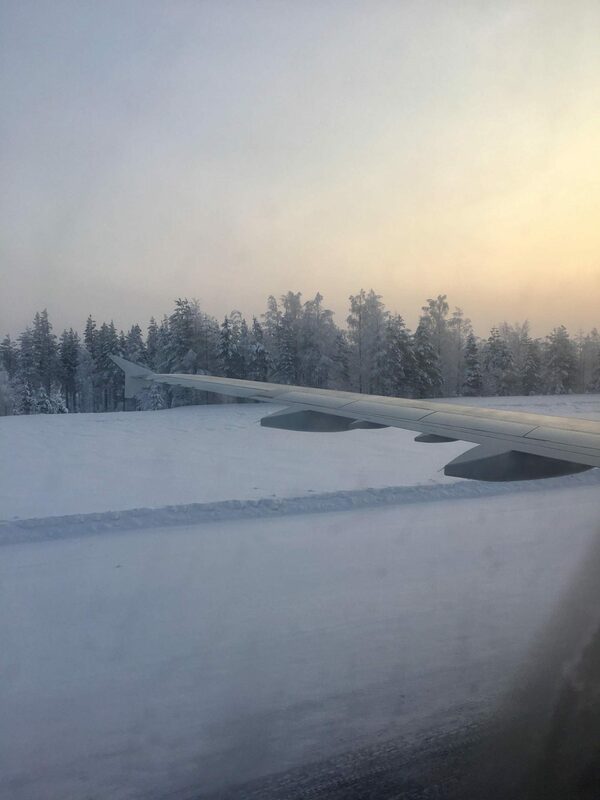 Getting to Rovaniemi is fairly straightforward – there are multiple flights a day with Finnair and Norwegian from Helsinki. Once at the airport there are plenty of taxis waiting, or a bus for €7 which takes you to the town centre. 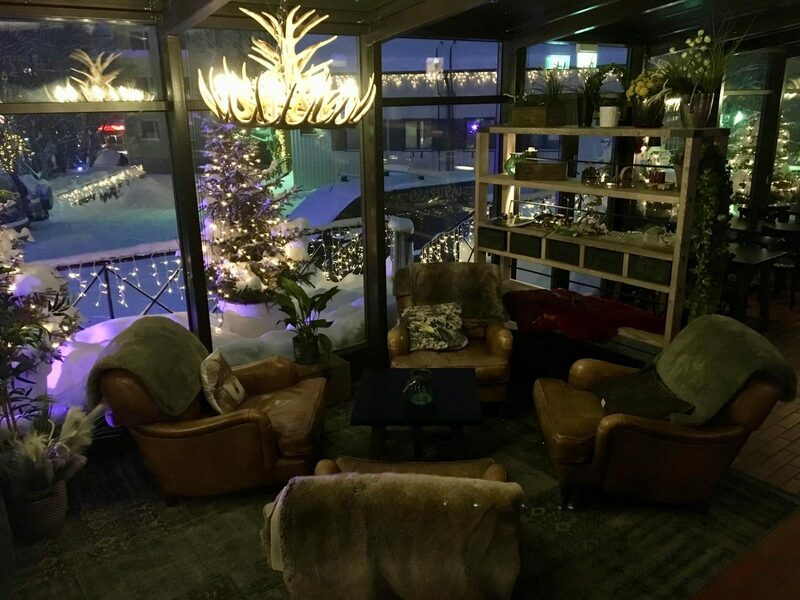 We stayed at the Arctic Light Hotel which I would highly recommend. 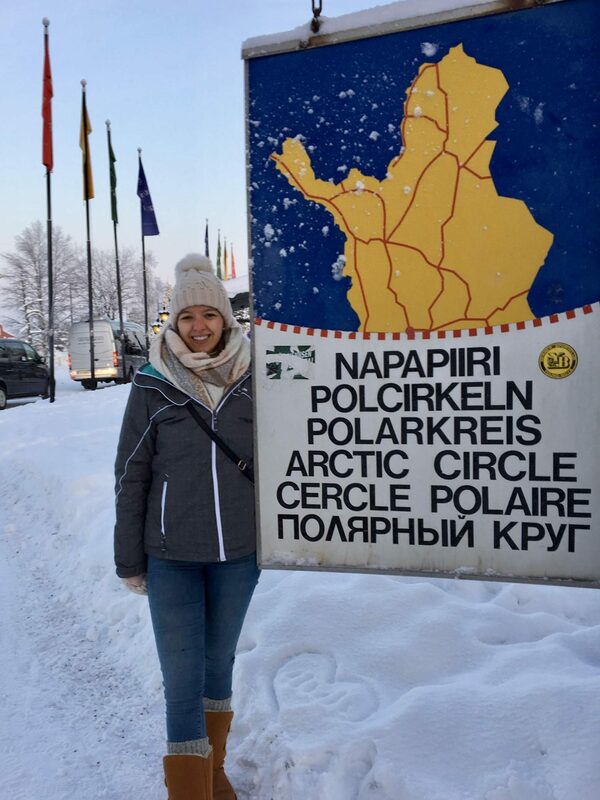 Restaurants that we ate at included the Arctic Boulevard, Restaurant Nili, and Monte Rosa, all of which served delicious local specialties. 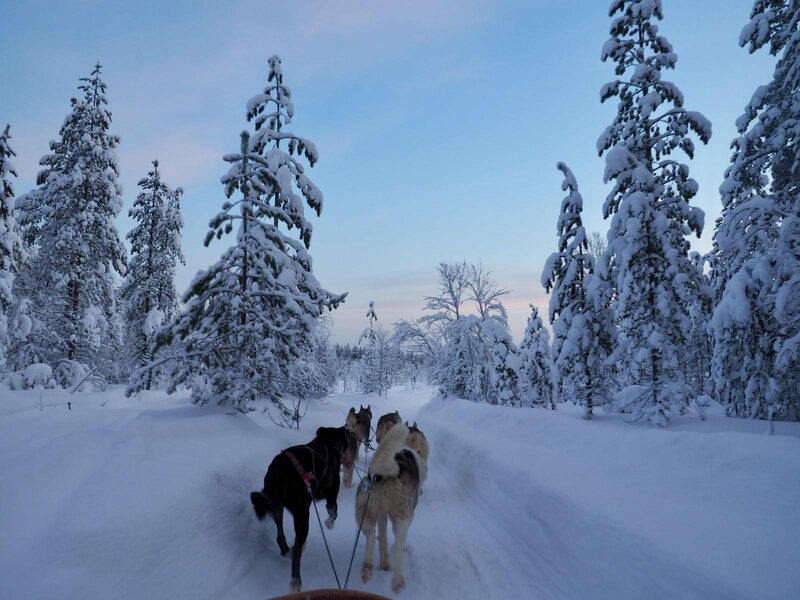 All activities can be booked through Lapland Safaris, who provide all the outdoor clothing and shoes you will need, as well as transport to and from the activity locations, such as the husky farm. 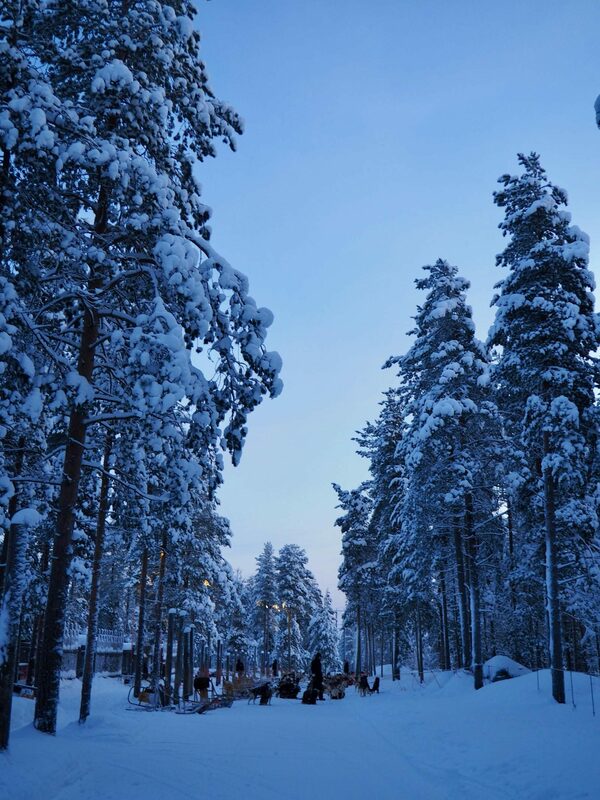 Have you ever been to Lapland, or is it something on your bucket list? Let me know in the comments below! What a great experience! 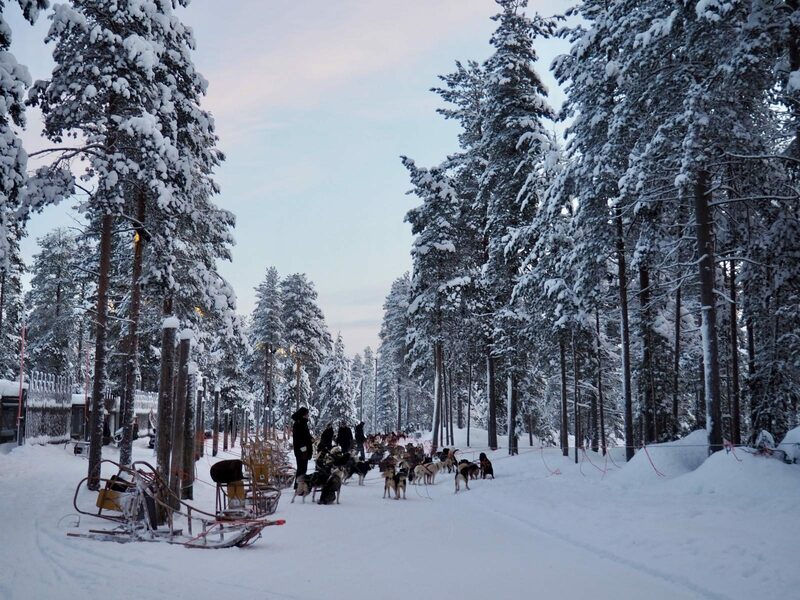 Lapland is on my bucketlist too, it seems so fun and those snowy views are amazing. Thanks for reading! 🙂 It was absolutely beautiful, I hope you get to visit one day! What an interesting trip you had! Thanks for sharing your experiences. 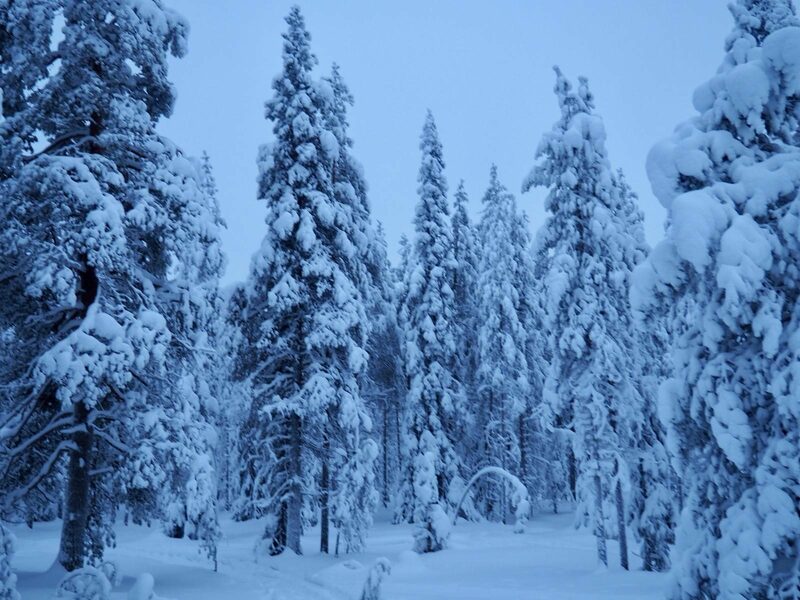 Lapland looks like a really neat place to visit….though I’m not quite certain I could handle the extreme cold. 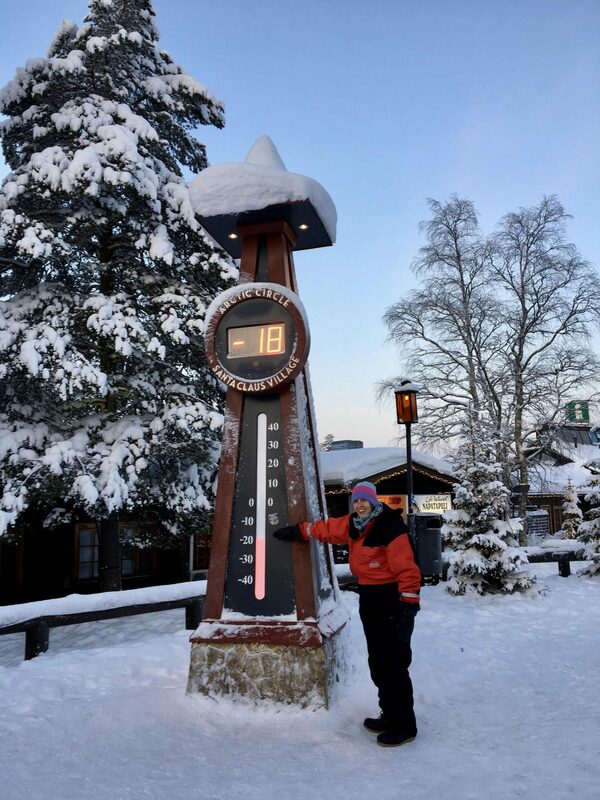 Being born and raised in Southern California, 60 degrees Fahrenheit is cold to me!